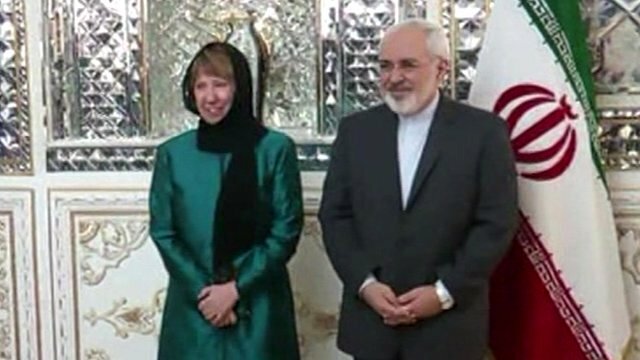 Iran’s Foreign Minister Mohammad Javad Zarif has told visiting EU foreign policy chief Catherine Ashton that a nuclear deal could come in the next four months. Mohammad Javad Zarif held talks lasting more than an hour with Baroness Catherine Ashton, who is making her first visit to Tehran amid a thaw in relations. “We can do it in four or five months and even shorter,” Mohammad Javad Zarif said. Catherine Ashton cautioned there was “no guarantee” her talks would lead to a comprehensive agreement. World powers want Iran to scale back its nuclear work to ensure it cannot assemble a nuclear weapon. The election of Iranian moderate Hassan Rouhani as president last year led to an improvement in ties between the Islamic Republic and the EU. In November, Baroness Catherine Ashton helped broker a deal to curb Iran’s nuclear programme in return for limited sanctions relief. Analysts say the war in Syria is also expected to be discussed, as Iran is a key ally of President Bashar al-Assad. It is the first visit to Iran by an EU policy chief since 2008.